“Fifteen years ago Duncan Usher was sent to prison for killing his wife, Valerie. Young Detective Solomon Gray was first at the scene. His biggest case yet. But Duncan Usher didn't kill Valerie. While someone was strangling Val, Usher had another man's blood on his hands. Usher took the fall for Val's death, but now he's out. Released on a technicality. He's held a grudge all this time, and he won't stop until he gets revenge on the dirty cop who framed him. Usher sets his sights on DS Solomon Gray. And he has no qualms about using Gray's son, Tom, as a pawn to get what he wants. 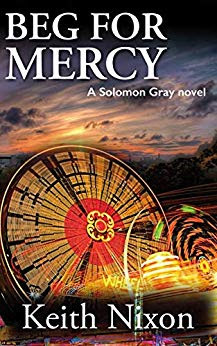 If you’ve read the two prior books in this series you’ll be familiar with not only Solomon Gray, the series protagonist, but also his coworkers in the local police department, plus Frank McGavin, the local crime boss. While he got a brief mention previously, it wasn’t obvious that McGavin essentially took over for Duncan Usher, who was convicted of murder in Solomon’s first big case. When Usher is unexpectedly released from prison due to a technicality, it kicks off an investigation of the original investigation and those involved in in. This is the third book in this series. It can be read as a stand alone with the needed back story being explained as needed.